While there typically aren't all that many unanimous decisions around here, at least I can rest assured that my kids are getting a lot of practice learning how to compromise, right? But although they may have to give up watching one movie for another or playing one particular board game tonight and letting another wait until tomorrow, there are never any squabbles, complaints or waiting when it comes to Honey Bunches of Oats. What started back with the original Honey Bunches of Oats, the collection of flavors has grown to now include 12 different varieties such as Strawberry, Vanilla Bunches, Cinnamon Bunches, Pecan Bunches, the new Fruit Blends in Peach Raspberry and Banana Blueberry, and more. 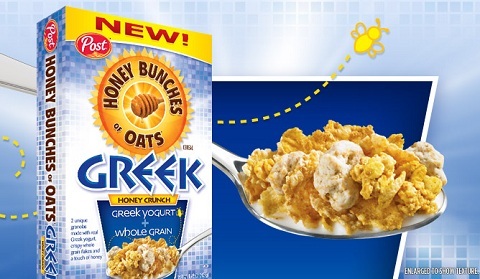 So, as already-big fans of this cereal in our house, we were excited to hear that yet another new flavor had joined the Honey Bunches of Oats lineup: Honey Bunches of Oats Greek Honey Crunch. New Honey Bunches of Oats Greek Honey Crunch is made by combining two unique granolas, real Greek yogurt, crispy whole grain flakes and a touch of honey. With 33 grams of whole grains, one bowl provides over two-thirds of your day's whole grain goodness. Along with all of those whole grains, one cup of Honey Bunches of Oats Greek (230 calories) also provides 12 essential vitamins and minerals and 5g of protein. But let's be honest. The nutritional information is important to us parents, but we all know that there's only one thing that our kids care about when it comes to introducing a new cereal to the breakfast table: how does it taste? 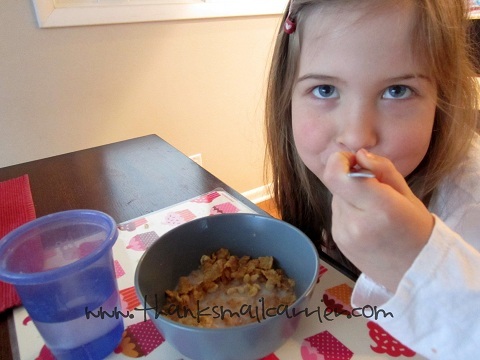 While I initially wondered if either of my kids would be able to swap out our traditional Honey Bunches of Oats for the new variety, all hesitation was completely dismissed once they both dug right in and kept on eating. Big Sister E was especially an instant fan of this new variety of Honey Bunches of Oats and marveled at each and every granola cluster, crunchy flake and Greek yogurt bit that she found! Even though Honey Bunches of Oats was already a staple in our household, I'm happy knowing that my kids have welcomed yet another good-for-you cereal (that is made with real Greek yogurt) into the rotation. I love knowing that I'm sending them off to school having eaten a filling breakfast and that their bellies are full of whole grains and protein! When it comes to starting off the day in a healthy, delicious way, Honey Bunches of Oats has always been the first box that we reach for in the cupboard. Now that they have given us the ability to extend our breakfast love even further with Honey Bunches of Oats Greek Honey Crunch (as well as their many other great new varieties), we can have a different flavor every day of the week if we want to — if you haven't picked up one of their many new boxes, try one today! I am part of the Mom It Forward blogger network. Mom It Forward and Honey Bunches of Oats partnered in support of this campaign. Honey Bunches of Oats compensated me for participation in this campaign. However, all thoughts and opinions are my own. Yum! I didn't know they've started a Greek yogurt blend of Honey Bunches. Normally I find most cereals too bland for regular breakfast fare, but the yogurt bits mixed in with the honey clusters in this one would probably convince me to have it everyday. I also like that one cup of the cereal accounts for 12 vitamins/minerals and 5 grams of protein! 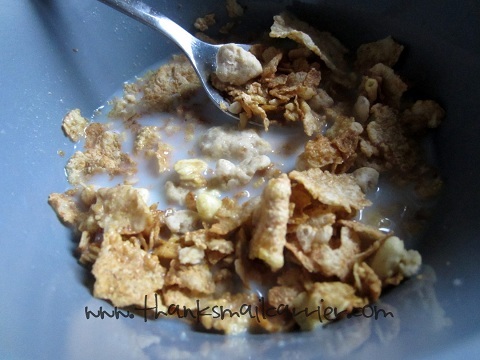 I love this cereal, it is yummy and I love the crunchiness and of course the honey which is better for us than sugar. I am a diabetic and have to watch my carb intake and this cereal helps me feel full and satisfied. I have always been a fan of the honey bunches of oats cereals, but now I really want to try the Greek yogurt blend. Great Review! It tastes soooooo good and is so filling! I'd like to try the new Greek version. I think I will try this flavor cereal soon; thanks for review.